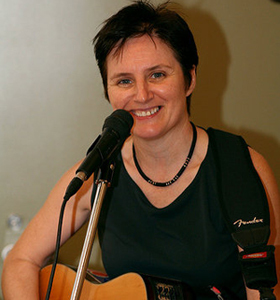 Mary Courtney was born and raised in Castlegregory, Co. Kerry into a large musical family. Both parents sang and played instruments, as did aunts and uncles on both sides. She started singing at a young age, and learned many songs from her Mom. She now lives in NY, and performs throughout the US as a solo artist, and also with her band Morning Star. She has also guest appeared with Black ’47 as the female vocalist on Livin’ in America. Some of Mary’s memorable performance include singing the Irish national anthem for Martin McGuiness’s memorial mass in 2017 at St Patrick’s Cathedral, singing for JFK Jr’s memorial mass, and singing at Father Mychal Judge’s mass at Old St Patrick’s Cathedral. Learn traditional Irish songs from over the centuries, including songs from some of Ireland’s rebellions. Learn songs in both Irish (phonetically) and English, some accompanied by Mary on either guitar or bodhrán, and some a cappella.